Manage the entertainment experience directly from the individual listening zone of your vessel with the addition of the MS-NRX200. Most stereo functions are replicated by the remote, with full control of the volume, balance and subwoofer level at your finger tips. Control every audio zone on your vessel from the unit or assign the remote a specific zone to control. 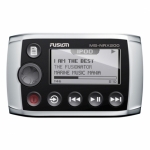 FUSION’s MS-NRX200 wired remotes can be installed anywhere on your vessel. 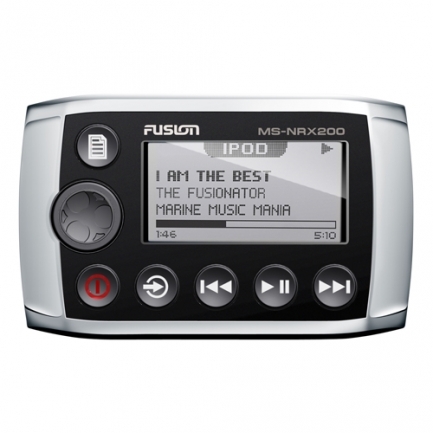 Wire the remote conventionally directly to the FUSION marine stereo with FUSION cabling or wire directly to an existing NMEA 2000 network, removing the need to run cable back to the stereo. The fully sealed enclosure of the MS-NRX200 is rated IPx5 water resistant, ideal for installation around the boat or on the deck. The MS-NRX200 is rated True Marine, backed by a 3 Year Limited Consumer Warranty.